To talk about the origin of this vessel, we must travel to the New York of 1935. There, the sailor Van Santford Merle-Smith commissioned the architect Crane to design a racing boat for competitions for the category of 12 meters. She was the first yacht of its kind developed by Crane and her initial success was overwhelming, after winning six races in just three years. In 1943 the Portuguese José Concalves acquired and moved the boat to the port of Lisbon, renaming it as Sunday. She remained there until 1985, participating in some competitions until the end of the sixties and being used for cruises on special occasions. She spent a short time in the Spanish city of Vigo, where she was partially renewed. 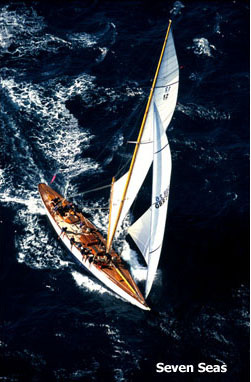 In 1990 she came back to Portugal and regained her original name, Seven Seas of Porto. Since then, she has modernized her appearance almost fully, including the interior design, the deck, the masts and the rigging.